In stark contrast with the skyscrapers of urban Bangkok, historic Old Town Chiang Mai will give you a feel for the real Thailand. Founded in 1296 as the new capital of the Lanna Kingdom (after Chiang Rai), Old Town is gritty, rough around the edges, enchanting, and is absolutely beautiful. Inside just one square mile, Chiang Mai ‘s Medieval wall lays the boarders for Old Town which is packed full of amazing sites. On this Chiang Mai walking tour, you will encounter ancient temples, great food, and tons of Buddhist monks. If you wish you can even join a monk chat roundtable with the younger monks (learn more). Hope you enjoy our free Old Town Chiang Mai walking tour! There are over 120 different Temples (Wats) in Chiang Mia, so narrowing down what to see can be difficult. In our Chiang Mai walking tour we have narrowed it down to the best stops, but remember that the Giving of Alms happened only early morning (sometimes at Noon) and the best markets are only in the evening. Seeing everything in Old Town within a day is doable and you can see our Suggested Itineraries For Chiang Mai. 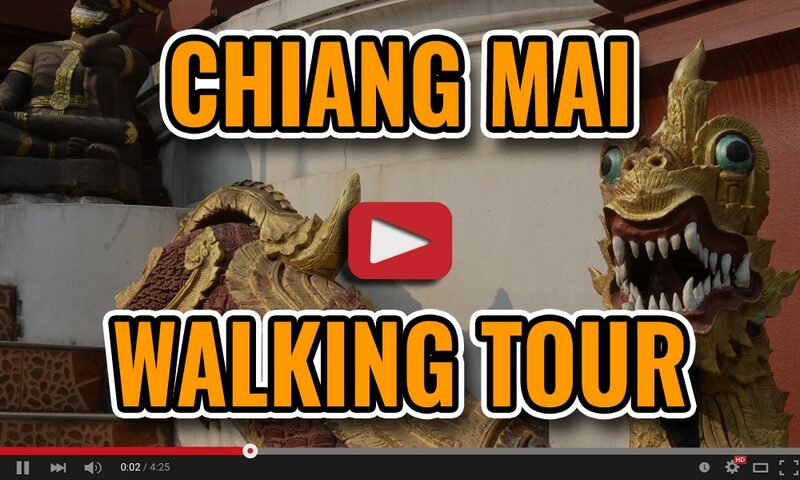 We hope you enjoy our Old Town Chiang Mai free walking tour! About The Three Kings Monument: Sitting in the middle of a large courtyard, the Three Kings Monument has a large bronze statue of King Mengrai (the founder of Chiang Mai) and his two friends, King Ramkamhaeng of Sukhothai and King Ngam Muang of Payao. The three of them worked together in the late 1200’s to design and build Chiang Mai. Residents treat the Monument as a shrine for the three men and replicas of it can be found throughout the city. You’ll often see locals giving flowers, incense and candles at the Statue as offering to get blessing from these three revered men. As the tourist the main reason to visit the Monument is to give early morning Alms to the Monks described below. The large white building behind the statue is the Old Provincial Hall, built in 1924, which today holds the City Art and Culture Center. If you decide to check it out they have you sit through a short video on the history of Chiang Mai before cutting you loose. The 1st floor has a number of displays going over the religion and culture of Northern Thailand while the 2nd floor has rooms that have been converted into an early Lanna village, a Thai temple, and even a train car. On the South side of the Monument’s courtyard is Wat Sadeau Muang, a small, but beautiful dark teak wood temple with gold accents. Wat Sadeau Muang or Temple of the Navel of the City, is the former site of the City Pillar (Inthakin) and the site of why King Mengrai chose this area of the center of the city. It’s said that while hunting in the area the King witnessed two white deer fend off an entire pack of hunting dogs fearlessly which was an ominous sign. About Morning Alms: The courtyard around the 3 Kings Monument is the best place to give early morning Alms to the Monks in Central Chiang Mai. Although Alms are a daily commonplace in Buddhist life, for a tourist it can be a life-changing experience. The young monks, mainly 8-20 years old, walk through with brass bowls collecting Alms as Merits that range from money, to fruits, and many other goods. Collecting the Alms as Merits is believed to lead to a better next life or to lessen the number of times the Monks must be reincarnated before reaching lightened nirvana. Giving of Alms happens daily anywhere between Dawn and 8am when the Monks go back to either school or mediation. Because it’s so early we suggest buying your Alms the night before, which can be anything from money, to fruit, to stick rice, to toothpaste & toiletries. Anything is welcome and some shops even have pre-bundled packages for you which are easy but often overpriced. We suggest giving fruit or prepackaged snacks and recommend asking your hotel for tips for preparing the night before. Your hotel can also give you guidance on what time to head over for Alms. Keep in mind that this chore of gaining Merits is part of the Monks spiritual journey and you really should be respectful. Many tourists are too focused on getting the right photo and pushing in front of blasting their camera flash in the Monks faces; don’t be that guy. Take your photos and videos for sure, but you’ll enjoy the experience much more and take it in better if you act like a local. If you miss the morning public Alms giving, the monks at many temples also take Noon Alms but you must go to the temple to give. Don’t use Noon Alms as an excuse to miss the morning ones though. If you have gone through all the trouble of traveling to Chiang Mai, surely you get out of bed early one day to witness this magical event. About The City Museum: Chiang Mai doesn’t have a lot of traditional museums since the city itself is a living time capsule, but there are a couple decent ones. The best if the City Museum grouped into three buildings around the Three Kings Statue including the Cultural Center inside the Old Provincial Hall, then the Historical Center behind the hall to the East, and the Lanna Folklife Museum across the road to the East. The Culture Center is geared mainly toward locals to help make sure traditional culture is preserved through education. The History Center covers architecture, language, food, dress through Lanna, Burmese, and Thai control over 700 years of Chiang Mai’s History. Archaeological excavations on display inside show two ancient walls from a temple or royal palace that sat here before the Provincial Hall was built on the grounds in 1924. The Lanna Folklife Museum was the most interesting of the three for us as it covers Buddhist art, rituals, paintings, and sculptures which together helped us better understand local ceremonies. If you are in Chiang Mai for a few days it is for a stop, otherwise, you can skip the Museums. City Museum Website: HERE. City Museum Hours: 8:30am-5pm Tuesday-Sunday; Closed Mondays and during the Songkran Festival. City Museum Cost: One ticket for all three buildings with Adult 90 Baht; Child 40 Baht. About The Temple of the Fortified City: This temple is the oldest in Chiang Mai and was built shortly after the city’s founding in 1296 when the capital was moved here from Chiang Rai. Although not very photogenic, the Temple has a rich history as it was built on the same spot King Mengrai built his palace after moving the capital from Chiang Rai to Chiang Mai. Wat Chiang Man also houses two very important Buddha images the marble Phra Sila and the crystal Phra Satang Man both said to be 2,000 years old. The entire complex is a great example of Lanna architecture, which is the Kingdom that Chiang Mai served as the capital of. The oldest building in the complex is the Sri Lankan style Chedi called Chang Lom Chedi which literally translates to tower “Surrounded by Elephants”. This Pagan inspired tower is supported by 15 elephant statue which represents a sea of unformed matter and the Chedi floating on top represents the cosmos. Although the elephant statues could definitely use a whitewashing, they are still really cool. The Buddha statue inside the Temple’s Ordination Hall is said to be the oldest intact Buddha in Chiang Mai dating back to 1465. Even cooler than the Buddha statue are the beautiful red and gold murals depicting the life of Buddha inside the Hall. The outside shutters of Hall’s side windows are painted in a similar red and gold fashion to the murals. The large garden-like ground surround the Hall make for a beautiful backdrop. If you are more interested in the early days of Chiang Mai, feel free to take a detour to nearby Wat Lam Chang meaning “shackled elephants”. During the building of Chiang, Mai King Mengrai stored his white elephants in the wooden area here. About Wat Hua Kuang: As you walk through the red gate leading to Wat Hua Kuang Temple (also known as Wat Saen Muang Ma Luang) you’ll find you are in for a surprise. The complex seems small at first but then keeps going back further and further. The first two structures have multi-tiered rooflines with white lions guarding the building on the left and snakes (naga) guarding the Ordination Hall on the right. The Ordination Hall has a golden lattice facade and a grey elephant statue instead of the royal white elephants normally on display at other temples in on this Chiang Mai walking tour. As you follow the walkway between the two initial buildings, notice the beautiful red and white architectural details on the side of the main building. These details gain accents of gold paint as you reach the rear courtyard need a large stone chedi mound. While Wat Hua Kuang is skippable for some visitors we love stopping by to take photos of the details of the temple. About The White Elephant Gate: Welcome to the North Gate, called the White Elephant Gate, and your first glimpse at Chiang Mai’s Medieval wall. As King Mangrai founded the city to be the new capital of the Lanna Empire in 1296 (previously was in Chiang Rai), the original wall was built to protect the 1 square mile town. Over the years the wall was further fortified, gated and moated for added protection. At only 15-feet-tall the moated wall did a great job of protecting the city for over 600 years. This Northern Gate was originally called Head Fortified Gate (Hua Vieng) as it was believed that this area was the head of a living city. Around 1400 the name of the gate was changed to the White Elephant Gate (Chang Puak) after the white elephant monument was erected nearby. It’s said that King Geu-Na (8th Lanna King In Chiang Mai) had a piece of Buddha’s shoulder bone and let a sacred white elephant free out of this gate to find a spot to build a shrine for the relic which hilltop Doi Suthep Temple outside of the city. King Geu-Na was also famous for introducing Buddhism to the kingdom and his gate used for coronations of future Lanna Kings until the Burmese controlled the area from 1578-1774. During the Japanese occupation of Chiang Mai in WW2, most of the city wall was torn down so the bricks could be re-purposed. Thankfully from 1996-69, the city decided to rebuild 5 of the original city gates plus all four corners of the square-shaped wall. To add authenticity, the Chiang Mai rebuilt the brick wall sections exactly how they appeared based on a series of photos from 1899 and they did a great job. About The Golden Horse Temple: It is impossible to miss the odd wall surrounded by golden horse statues surrounding Wat Kun Kha Ma. About 50 Statues in all run the entire length of the fence and vary quite a bit in size. On the inside of the wall are statues of different animals for the Symbols of Everybody which are similar to the symbols for each year in the Chinese calendar such as the rat, co, and snake to name a few. 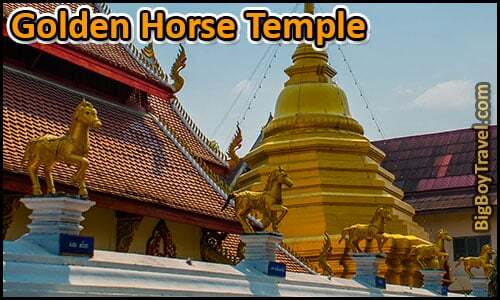 This Temple is not to be confused with the Golden Horse Monastery near Chiang Rai which houses Monks that study Muay Thai for defense. Just past the horse temple on the left is a shack of a restaurant under a small pavilion called Grandma’s Restaurant (Khao Soi Khun Yai) popular with locals for its northern-style noodles. About Wat Ratcha Montien: The Dragon Temple (Wat Ratchamonthian, Ratcha Montien) has the best curbside appeal out of all the temples on this free Chiang Mai walking tour. The temple dates back to the 1400s and you are drawn in by the massive maroon and gold spires as you approach Wat Ratchamontian’s steps. Two playful dragon statues guard the entrance to the North-facing steps along with some help from chubby black foreigner (farang) figures. As you climb toward the maroon doors of the Dragon Temple, you’re struck by the huge seated Buddha statue on a raised platform to your left in what is called the Earth Witness pose. This massive white Buddha in a golden robe is very inspiring and the platform is a great place to take photos. The inside of the main temple’s upper level resembles a grand hall of a palace with open spaces, large red pillars, and an imposing Buddha statue with ornamented clothes and headdress. About Wat Lok Moli: Built in the mid-1300s, Wat Lok Moli (or Molee) is one of our favorite Temples in Chiang Mai. The grounds were originally used as a Royal Palace until 1397 when King Guna turned it into a place to house 10 visiting Monks from Burma he brought in to further spread the word of Buddhism. The grounds remained largely untouched 1527 when King Phra Muang Kaew started erecting the temple’s current buildings. First came the giant three-tiered brick Chedi and was followed by the large Ordination Hall (ubosot). When the King was assassinated in 1545 his ashes were buried here and his wife Queen Wissuthidhevee took over the rule of Chiang Mai. Sadly just 11 years later the Burmese overtook Chiang Mai on the start of a 224-year occupation, but they left the grounds largely untouched and even buried the Queen here with a large ceremony when she died in 1578. About The House Of Success: As you approach the Northwest corner of the old city, the 3-story European-style mansion on your left it truly stunning. It is rare to see an actual house in Old Town, especially one so big and opulent. Now part of a luxury hotel, originally this mansion was called the Janghuarinnakorn House when it was built in 1993. This roadside estate was quickly nicknamed the White Lion House for its statues and then bare white exterior. The mansion was part of a three-house complex built by ‘Tycoon Jack’ Chaipanich to help his real estate company close condo sale deals around Northern Thailand. The real gem of the property is the even more impressive giant ornate mansion further up the driveway known as the House of Success. Wow! The House of Success with its huge marble columns, multi-colored stone accents, and sprawling fountain belongs more on the grounds of an Italian palace than a Chiang Mai side alley. This otherworldly mansion may be the most beautiful building in Chiang Mai. It wasn’t always rosy for the grouping of mansions as this corner of town has long been called cursed and the bad feng shui in the building design is said to have brought them bad luck. Just three years after they show homes were built the booming Thai real estate market crashed and they were left partial unfinished and abandoned. Local folklore also says that family in the White Lion House went mad from the locations bad juju and the dad hacked up his family before killing himself. That seems a little far-fetched, but ‘Tycoon Jack’ did get taken to court in 2003 on forgery charges over the will of the Kitprayoon family who were shot to death. After sitting vacant (outside of squatters) for 20 years, the collection of mansions opened up as the Pingdoi Hualin Boutique Hotel in 2017. The renovations and construction the group has done is such an impressive difference from when we visited the empty homes in past years. Inside and out, the hotel looks custom built for an editorial magazine, it’s simply beautiful. About Hua-Lin Corner: The recreated section of Chiang Mai’s Medieval wall near Hua-Lin Corner is very cool. It is the perfect place to walk on top of the wall and inspect its worn appearance which makes it look much older than it is. The original wall was started in the after Chaing Mai became the capital in of the Lanna Empire in 1296 AD before being fortified and moated over the years. During a Japanese occupation in WWII, the wall was taken down to re-purposed purpose the bricks. From 1966-1969 the wall was reconstructed by the City based on how it appeared in a series of photos from 1899. When you get to the corner of the wall you’ll notice an interesting curved outcrop where a watch tower once stood known as Hua-Lin Fort. About Riding In A Tuk Tuk: If you have yet to take a ride in a Tuk Tuk, this is the perfect time to do so and it’ll save you almost a mile (0.7) long walk to the next stop. Tuk Tuks taxis are all over the in Chiang Mai’s old town so flagging one down is usually very easy. These 3-wheeled mini-taxis are a quick, cheap, and especially in Chiang Mai are a really safe way to get around. Tuk Tuks can be intimidating since they don’t have seat belts and they often drive a little crazy, but in Chiang Mai you going to be on streets that way smaller and less congested than cities like Bangkok. When in Rome, ride a TukTuk. You’ll be able to easily fit 2-3 people on any TukTuk and some will have a makeshift seat for a 4th person up front. We’ve seen 6 people stacked in the back which probably wouldn’t be fun, but it’s Thailand where sometimes you’ll see 6 people on one moped. If you aren’t seeing any Tuk Tuks, or don’t yet feel comfortable with them, you can flag down a Red Truck Taxi. These small red trucks have benches in their beds covered by a topper. Alternatively, you can always walk the 0.7 miles to the next stop along the moat of Chiang Mai’s city wall which takes around 12 minutes. You can break up the long walk by stopping at the peaceful Wat Pansao which has a large stone chedi and almost no tourists. The Western facing Flower Garden Gate (Suan Dok) is also very easy to see while walking. Tuk Tuk Cost: Expect to pay 50-80 Baht ($1.50) ride from Hua-Lin Corner to Wat Phra Singh. About Wat Phra Sing: The Wat Phra Sing complex is one of the most popular in Chiang Mai and is home to over 600 active Buddhist monks. As you approach the temple, you first come to the main Wihan Luang Sermon Hall (Viharn) which is the largest building in the complex dating back to the 1300s (rebuilt in 1925). Inside the hall is a massive Subdued Buddha Statue which was cast in 1477. Many visitors often incorrectly think this is the Lion Buddha because of the golden fan haloing its head. Exiting the Main Hall, the neighboring Scripture Library (Ho Trai) to the North has our favorite exterior in the complex. Built in the late-1400s, the elevated library displays classic Lanna-style architecture with its elaborate red roof. The library is small but is full of Buddhist scriptures which are protected from flooding thanks to the building’s raised white platform. Working your way back around the Southside of the Main Hall you are able to see the most famous viewpoint at Wat Phra Sing. You will have the timeless Golden Pagoda (Chedi) framed with the Ordination Hall (Ubosot) on the right and the Gilded Sermon Hall (Lai Kham Viharn) on the left. The central stone chedi (now covered in gold leaf) was the start of the temple when it was built in 1345 by King Phayu to house the ashes of his father King Kham Fu (4th Lanna King In Chiang Mai). Inside the Lai Kham Sermon Hall to the left of the Chedi is home to the famous Lion Buddha Statue brought here in 1367. This statue said to be the holiest icon in Chiang Mai as it came from the Mahabodhi Temple in Bodhgaya, India where Buddha gained enlightenment. Don’t let the phrase lion-style get you too pumped up, as to us this historic statue looks pretty much like a standard golden Buddha. The head of the Lion Buddha was stolen in 1922 which has since been placed by a replica. During the Songkran Festival each April, this holy statue is paraded through the streets and sprinkled with water by locals. The interior of the Lai Kham Sermon Hall is awesome with massive columns framing the Lion Buddha Statue in front of a gold & maroon back wall and side murals from the 1820s. The murals on the left wall show the history of Songthong and on the right wall the history of Suwanna Hongse. To the Right of the Chedi is an Ordination Hall (Ubosot) from 1806 where monks get ordained. There is also a replica of the famous Emerald Buddha here which was once kept in Chiang Mai and now sits at the Grand Palace in Bangkok. A nearby outbuilding houses a long reclining Golden Buddha Statue. The image of the reclining Buddha represents the Buddha just before his death and his passage into nirvana. As you leave the Temple grounds you’re bound to see a couple crazy ladies with birds in woven nets trying to get you to “donate” to release one for good luck. It seems like everyone is always trying to get you to do something for good luck in Thailand, but don’t give these ladies any money or you’ll just be encouraging them to catch more birds. Hours: 6am-8pm. Cost: Grounds are free, but the Main Sermon Hall is 50 Baht. About Wat Tung Yu: As you approach Wat Tung Yu you’ll run into a pavilion with a bunch of life-sized wax Monk figures holding bowls you can make offerings to which seems a little strange. As part of giving an offering, the Temple usually lets you add your name to one of the wooden shingles the temple makes to uses to re-shingle surrounding temples. If you look closely at the main Wihan behind you can see what the lacquered shingles look like after fit together. The Wihan itself has fairly beautiful snake (naga) guardians and golden doors that can be closely inspected as there are most likely no other tourists to get in your way. Just passed the main Wihan is a pretty cool statue grouping with a golden parasol in the middle flanked by a golden monk to the left and silver monk to the right. We’re not quite sure what the pairing represents but it is pretty cool and unique. The grouping is cool enough that you almost don’t even notice the beautiful meditating Buddha statue next to it. Behind the statues is a smaller golden Wihan building guarded by snakes (nagas) with a beautiful red and gold door featuring heavenly dancers on it. About The Fallen Child Statue: Sitting in front of Chiang Mai’s police station, the mustard-color statue was added in 1972. It depicts a policeman holding a fallen child and another naked child pulling on his coattails. The Fallen Child Statue is a symbol of service and you’ll see it on bumper stickers all around Chiang Mai. On the block past the Police Station, the Buddha image at Wat Chaiprakiat is a favorite among locals and is called Chai Phra Kiat. To us, this temple is pretty run-of-the-mill, but it has an interesting set of images and trilingual inscriptions in Burmese, Mon, and Thai speaking of the “Golden Age of the Lanna Kingdom”. You won’t feel like you missed anything if you only look at the temple from the road as you pass by. About Wat Pan Tao: If there was ever a temple in Chiang Mai that made you feel like you were stepping into the past it’s Wat Pan Tao. The temple was built in the 1300s as one of four temples in the Royal Stupa Complex next door. Stepping through an intricately carved red sandstone archway, a dirt pathway leads past a large wooden Sermon hall, small huts, tung banner flags, a tulip pond, all the way to the Monk’s outdoor laundry mat. Don’t be surprised if you see chickens or other animals roaming the grounds of the as you take in the sounds of both chanting and bells. The temple is called The Monastery of a Thousand Kilns because it was once used as a factory of sorts where monks would produce handmade Buddha Statues for other temples. The large teak wood Sermon Hall is the main attraction and was moved here 1875 by King Inthawichayanon. The building, which is one of the only remaining all wood temple buildings in Chiang Mai, had been part of the Royal Residence of the King prior to King Inthawichayanon. In Lanna tradition, each new King would build a new palace and re-purposed the one of the prior King. The dark teak is beautiful and really helps the golden peacock embellishment above the front door stand out, which is a symbol for the King. Inside of the Sermon Hall is a beautiful Dhamma Casket which holds ancient Buddhist scriptures written on dried palm leaves. Before the printing press, this was a common way of writing down and copying books in Asia. Hours: From Dawn to Dusk, but is pretty empty during early morning Alms and the Sermon Hall is closed during mid-morning mediation. 360 Degree Photos: (Inside Main Wihan). Loy Krathong Festival: During the Loy Krathong Festival which takes place each year on the full moon of the 12th month of the Thai Lunar Calendar (typically November), Monks at the temple light and release floating balloons made of paper at night. About The City Pillar: The incredible Wat Chedi Luang Temple complex is one of the best in town and we like to break it into a few segments. Entering the complex you first come across the large triangle facade of Sermon Hall covered in gold gilding with blue and green, peacock-like ascents. The interior of the Sermon Hall is supported by large black columns covered in gold patterns that lead you to a huge standing Buddha statue called Phra Chao Attarot. The size of the middle Buddha figure looking down on you with a blessing pose may make it easy to overlook the dozens of smaller Buddha statues gathered around the altar. Heading back outside make sure to check out the gigantic Gum Tree to in the Southeast corner of the complex. The Gum Tree seems to stand 4 times taller than any surrounding buildings and it’s said as long as the gum tree stands the city will have good fortune. The small White Chapel near the base of the Gum Tree houses a log from the original Chiang Mai City Pillar (Sao Inthakin) which is believed to protect the city and is home the Inthakin Festival in May. The walls of the compact interior are filled with a beautiful collection of colorful murals that may be the best art on this Chiang Mai walking tour. The golden shrine in the center encases a piece of the City Pillar which was originally erected in the center of Chiang Mai by King Mengrai who founded Chiang Mai in 1296. The Pillar was originally dedicated to the spirit of the city and is said to protect Chiang Mai from evil and disaster. If you came in the main entrance to the temple, make sure to see the green guardian statues on the outside of the gate next to the city pillar before moving on. About Wat Chedi Luang: Continuing on to the center of the Wat Chedi Luang Temple it’s time for the main attraction, the huge brick pagoda known as the Great Stupa. When the pyramid-like Stupa was first built in 1391 it was King Saen Muang Ma built it to house the ashes of is father Ku Na. Over the next 84 years, other Thai Kings added onto the Stupa including surrounding it with 3 silver plated walls and topping it with a large spire to house the famed Emerald Buddha Statue which was moved here from Lampang in 1468. At its peak form, the Stupa was 275 feet tall, 184 feet wide and was covered in both bronze plates and gold leaf. It must have bee quite a sight indeed in all its glory. Unfortunately, as the Stupa was at its highest point it was rocked by the Earthquake of 1545 which brought down the huge Spire and part of the Stupa’s side making it unstable. The Stupa was reduced to its current 197 feet, which is still huge, and the Emerald Buddha only remained in Chiang Mai another 7 years before being moved to Laos in 1556 to avoid Burmese invader that ended up overtaking control of the city from 1578-1774. Today the Emerald Buddha Statue can be seen at the Grand Palace in Bangkok. With the Stupa unusable, not much was done with it until renovations in the 1990s. During the renovations, the current steps were added and Buddha statues were placed in the four niches on each side of the Pagoda. In the niche on the far eastern side of the Stupa is a black jade oversized replica of the Emerald Buddha. The Southeastern corner has the best viewing as you can really see the part that broke off in the earthquake, a great row of elephants statues are on display halfway up, and the light is usually excellent for photos. To this day the partially renovated Stupa remains the tallest structure in Chiang Mai’s Old City and is by far the main attraction. Knowing more about the Stupa before your visit will also help you notice it as the top occasionally peaks out above the buildings as you walking around old town. About The Monk Chats: On the North side of the temple complex is a great way to interact with young Monks looking to practice English with the Monk Chat program. Monk Chats are informal discussions where you sit at a round table and talk with prep school aged monks who are usually accompanied by their teacher. Location: Outdoor tables on the Northside of Wat Chedi Luang. Hours: Available Daily 9am-6pm, most abundant on Saturday & Sunday Mornings. Cost: Free, but we suggest leaving a donation. Read More: How To Join A Monk Chat. About The Food Court: You have to eat sometime and the outdoor Kad Klang Wiang Food Court has a number of great options for a sit-down lunch or dinner. There is a great Thai place, an Italian place, and the most picturesque eatery is the Chinese restaurant call Hot Chilli. The atmosphere of Hot Chilli is great with hanging draperies on the ceiling, lots of paper lanterns, flowers every, and many of the table have suspended bamboo swings as their seating. There isn’t much grab-and-go food and most places are going to be seat down. If you are looking for American-style fast food, you’ll have to wait until you get near stop 23 as there really aren’t any chains in Old Town. This stretch of Rachadamnoen Road is the center of the Sunday Walking Street, a weekly outdoor street market that runs from 4pm-Midnight. The road goes pedestrian only during the market and the nightly Chiang Mai Bazaar which is main knock-off designer products, the walking street is filled with the craftsmen and street food vendors from all over Northern Thailand. If you can’t make it on a Sunday, the same craftsmen do a weekly Saturday Night Walking Street on Wualai Road near the Silver Pavillion. About The Tha Pae Gate: In the heyday of Lanna Kingdom, the Tha Pae Gate was the main entrance into the city as it faced the Mae Ping River and therefore the trade routes. It was originally called the “Chiang Ruak Gate”, after the neighborhood outside the wall, but when the river embankment was removed in the 1800s to expanded the harbor they changed the Gate’s name to Tha Pae meaning “Harbor of the Floating House”. The floating house was very common among river traders and fisherman and can still be found throughout SE Asia. Like the rest of the wall, this section was torn down by the Japanese in WWII then rebuilt in the 1970’s based on 1899 photos. The City wasn’t quite happy with how this gate turned out and decided to fix it up even more in 1985. The end result looks almost a little too new, but it is still tons of fun to climb up. On either side of the Gate’s opening, you’ll find a set of steps that let you climb to the top of the wall and look out onto the moat below. Although quite safe, there is no handrail so be careful. As you exit the city wall and cross the moat, there are four small temple complexes which are worth your time if you are into photography. These four temples along with Wat Phan On just inside the city walls, are marked on our Chiang Mai walking tour map with some details, but didn’t quite make the cut to deserve a dedicated stop for non-photographers. About The Chiang Mai Night Market: You really can’t come to Chiang Mai without hitting up their Night Market & Bazaar. Night markets are a big part of the modern culture in most Thai cities and in Chiang Mai it’s really huge. The Outdoor Market and Covered Bazaar running Chang Klan Road is one of the largest in Thailand. The first section of the night market is the huge Ploen Ruedee Open Air Market sitting on the northern end of Chang Klan Road. The goods here cover a lot wider range of items from clothes, to knickknacks, great souvenirs, bamboo dishes, and of course counterfeit DVD’s, shoes, designer purses, backpacks, headphones, and electronics. The deals here are awesome and it’s a great time to work on your negotiating skills. Typically we’ve been able to get stuff 30-50% off especially when buying multiple items. Keep in the back of your mind that anything you like is going to have at least 5 more stands selling the exact same thing so if you don’t get a good deal right away shop around a little. Neighboring the outdoor marketing is the Covered Night Bazaar which is a labyrinth of store stalls, a central makeshift food court, and even a second-floor blues bar. The deals in the Covered Market are great, but because rent is slightly higher here than the open air stalls the product quality also seems to be a little better. They have souvenirs of course but have more housewares and nicer clothes than other local markets. On the Southside of Chang Klan Road is the Anusarn Market which is a mix of covered and open areas that opens daily at 11:30am. The overall experience here isn’t as good, but if you can’t make the night market, it is still a good backup place to buy cheap souvenirs. Ploen Ruedee Outdoor Night Market Hours: 6pm-Midnight Tuesday-Sunday; Closed Mondays. Indoor Night Bazaar Hours: Daily 6pm-Midnight. Anusarn Covered Market Hours: Daily 11:30am-Midnight. About The Silver Pavilion: The small, but growing, Wat Sri Suphan Temple sits right in the middle of a part of town loaded with Silversmiths which has lead to the Temple’s Ordination Hall being covered in silver metal. The shiny silver exterior and interior mainly comes from aluminum and nickel with a little bit of silver which is quite unique in a culture that mainly uses gold on their Temples. It seems that every nook and cranny is fully filled and covered with silver covered metal. The interior of the Ordination Hall is just as impressive as the outside, but keep in mind that women are not allowed inside. Make sure to take some time to visit the stalls with Silversmiths and Monks overlaying metal on very detailed carvings and statues before they are added to the Temple. We really love the carved ornate door and Hindu Ewan Elephant Statue. If you are hitting up the Saturday Walking Street Market on the neighboring Wualai Road, the Silver Temple turns it into a great two for one stop. About The Riverside Restaurants: Nestled long the banks of the Ping River are some of the best restaurants in Chiang Mai. Most of them have great views, patios, and live music. Our four favorite ones are from South to North are the River Market (website), The Duke’s (website), The Riverside (website), The Good View (website). The park on the Eastside of the Ping river next to Nawarat Bridge and near the restaurants is the best place to hang out at night during Chiang Mai’s floating lantern festival. About Mae Ping River Cruises: With 75-90 minutes rides with a farmer village stop, a dinner cruise, and cooking class options, it is easy to get out on the water with Mae Ping River Cruises. Their fleet of small ships ranges from traditional Thai wooden boats and antique barges.